A smart and courageous young reporter with an equally smart and courageous canine companion named Snowy and a knack for falling into globe-trotting adventure, Tin Tin is very nearly the definitive boy's adventure hero. The character made his debut in a Belgian comic book series written and drawn by “Herge” aka Georges Remi in 1929, becoming very popular in Europe for many decades and in several different mediums, including books, movies and TV. Director Steven Spielberg evidently became a fan after it was pointed out to him that RAIDERS OF THE LOST ARK bore certain similarities to Tin Tin's exploits, and it's easy to imagine that Spielberg's big screen THE ADVENTURES OF TIN TIN could just as easily have been an episode of YOUNG INDIANA JONES with a few minor tweaks. 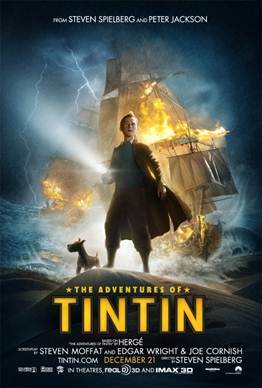 The plot is set in motion when Tin Tin (Jamie Bell) buys a model ship at a flea market. Arriving just seconds too late to buy the model for himself is the clearly up-to-no-good Sakharine (Daniel Craig). He offers Tin Tin a considerable sum for the ship, but finds it's not for sale. So he steals it, but only after Tin Tin has accidentally dislodged a secret hidden in the model, a fact only his dog Snowy is aware of. This eventually leads the youthful newshound into a caper involving daring escapes, dastardly villains, exotic locales and a stash of pirate treasure. The key to finding said treasure turns out to be Captain Haddock (Andy Serkis), a pathetic drunk whose ancestor left behind clues to the treasure's location that can only be deciphered by a true Haddock. Also adding color to the proceedings are Simon Pegg and Nick Frost as a pair of bumbling police officers on the trail of a mysterious pickpocket (Toby Jones), and a caterwauling opera singer named Bianca Castafiore (Kim Stengel). On a story level, THE ADVENTURES OF TIN TIN has potential, but thanks to a number of issues that potential never comes to fruition. First and foremost, the movie drags. When you're watching a movie and your mind starts to wander to thoughts of, “Just how long have I been in this theater, and how much longer can this go on?”, that's never a good thing. Then there's the excessively bland villain played by Craig. Not once did I get any sense of real menace from this character, and the way his henchmen kept trying to kill the heroes even after their boss had made it clear he needed them alive quickly grew old. Then there's the action scenes, which even though full of movement and spectacle, never really deliver the thrills. Oh, and one other problem with the movie. The film was shot using motion capture technology, with the actors then digitally transformed to look more like their illustrated counterparts. The results are just kinda' creepy looking, too real to be a cartoon, too cartoonish to be human. The effect this elicits has been termed by some “the uncanny valley”, which Wikipedia describes as, “when human replicas look and act almost, but not perfectly, like actual human beings, it causes a response of revulsion among human observers.” Either live action or straight up animation would have served the film far better. Creepiness factor aside, in the end I didn't hate THE ADVENTURES OF TIN TIN. I imagine young boys will enjoy the film, though young girls may be disappointed in the complete absence of any substantial female characters. For me, it was just... ok. I like the main character, I liked Andy Serkis as his drunken sidekick, I really wanted to enjoy the good old fashioned adventure yarn. And I guess for parts of the movie I did; just not nearly as much as I should have. 2 1/2 out of 4 stars.